Traveling dances such as 2 Step and Waltz move counter-clockwise around the floor. For safety reasons, as well as to ensure more people can fit on the floor, spot dances such as East Coast Swing may be simultaneously done in the center of the floor, with West Coast Swing danced in a ‘slot’ in the center along the length of the room. dry off in between dances. of heavy cologne or body sprays as they may affect an allergic dance partner. We would hate for anyone to miss out on dances due to hygiene issues. Be friendly! Maintain eye contact with your partner during a dance, without being creepy, so they don’t feel ignored. This increases your connection and dance ability with that partner. Make sure to smile and thank your partner! Even if you didn’t enjoy the dance, ALWAYS say thank you. This is extremely important for leads. Do not lead moves that are far beyond the ability of your partner. You could potentially hurt them, but more often than not you will just annoy them. Keep spins and turns to a minimum unless they are a very experienced dancer who you know wants to work on their spins. If you are unsure, build up to a higher level of movement starting with basic moves, then lead the more advanced move gently. Be sensitive to the follower’s body language. There is no rule that you MUST ask everyone for a dance (although that is generally the point), however there is an unspoken rule that when asked, we do not turn down a dance without a good reason. Acceptable reasons to turn down a dance may include: you feel the partner is too rough and may hurt you; you are unable at the time because you are headed to the washroom or you are leaving the dance floor area. If for some reason you do turn someone down for a dance, ask for a raincheck or go back and ask them later. As you become more experienced, it is important to continue dancing with, and asking less experienced dancers to dance. Everyone was a beginner once and we all get better by dancing with those with more experience. Asking a beginner to dance will make them feel welcome and more likely to come back. It is generally frowned upon (with some dancers feeling extremely offended) to correct or give technique advice on the dance floor. If someone wants advice, they will ask. Otherwise, It is best to leave the corrections to the instructor. During lessons, it is important to remain quiet so all participants can hear the instructor. Dancers who travel around the floor use the outside (fast) or inside (slow) lane depending on whether they are continuously progressing or Stop & Go. Never backup against the line of dance. 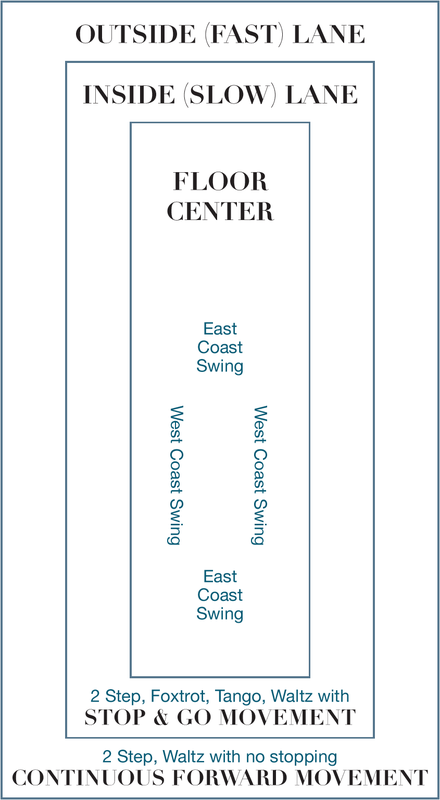 West Coast Swing is danced in the center of the floor in a slot the length of the room. East Coast Swing, and any dancers who stay in the same spot, dance in the center of the floor leaving the outside lanes open for progressive dancers. If the floor is crowded, take small steps and look in all directions to avoid collisions with other dancers. If a collision does occur, please remember that courtesy is contagious.